🌲 The holidays invite us to be intentional by spending time with colleagues, friends, and family. It is so easy to fall into individualized rhythms of busy routines and forget to make time for the people we love — but making that time is so, so important! It allows us to nurture closeness and mutual support, and by showing up for loved ones we also express our appreciation for their presence in our lives. 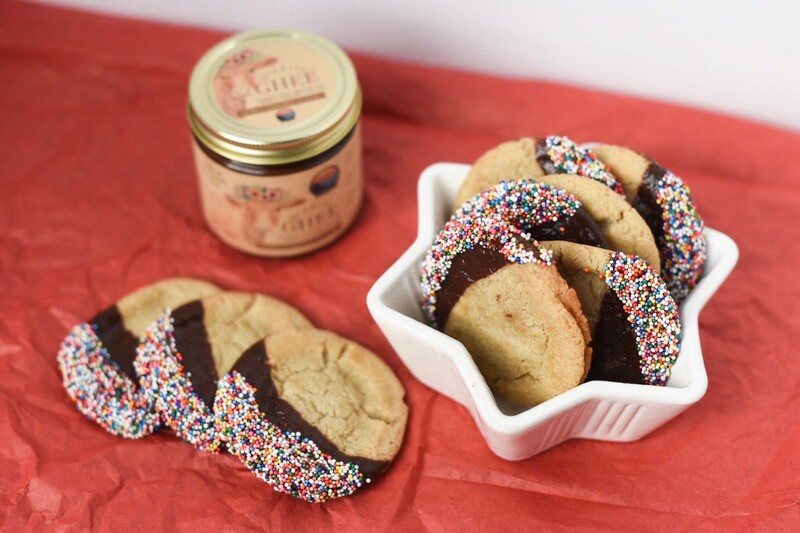 These @sweetlorens gluten-free sugar cookies are dipped in some of our @cbdsuperfood x @goddess.ghee Dark Chocolate Ghee and coated in sprinkles for festive flare. They are the perfect cookie to share at a holiday gathering to express gratitude for your loved ones! Bake sugar cookies as directed on the packaging. While the cookies are cooling, heat a small saucepan on the stove on medium heat. Remove from heat and add Dark Chocolate Ghee until it is fully melted. Dip each cookie halfway into the chocolate, then dip half of the chocolate section into the sprinkles. Place on cookie sheet to set for 10 minutes, then enjoy!